This is part 1 of our jigsaw reviews series to allow you rate what components on this professional power tool are a must have before deciding to buy. The introductory part of this jigsaw review is here: Jigsaw Review. The Top Handle is the more common and allows you to handle the saw numerous positions including the usual elevated position. 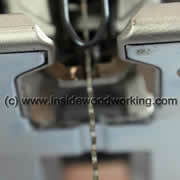 This adds to the artisan’s ability to proceed, offering greater control, particularly when trying more intricate cuts. More advantages of top handle jigs saws, including overhead (ceiling) cuts. The top handle, allows you to hold the saw firmly with only one hand. The barrel grip jig saw offers a better feel as you hold the tool a lower position on the tool. When you review a barrel grip jigsaw you’ll enjoy a better experience as the saw reacts when cutting through the workpiece. The barrel grip offers the craftsman better handling when doing reverse cuts. This is you turn the jig saw upside down and the cut is made from underneath the workpiece to prevent wood splintering. The type of handle you work with is your personal preference. Which ever type of handle you favor, you should take the time to test and compare wither of the jig saws prior to any buying decision. 550 - 650 Watts (5 to 5.9 Amp) - Professional jig saw, mainly used by cabinet-maker, kitchen assemblers etc. What makes the difference between great or poor jig saw cutting action in any product reviews? The better "ingredients" means that a powerful jig saw offers a larger blade stroke with a longer blade will afford you larger cutting depths. What value does this information give about how great or poor the jig saw will cut? - Certainly not much. For the jig saw in general, the cutting depth of the tool isn’t as important as you might think. Cutting depths or blade stroke are only indicators that offer you an idea of what the manufacturer recommends. When it comes to accuracy or real precise depth of cut, you have to consider other factors like the thickness of the blade; its guidance and orbital action. 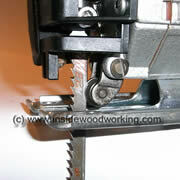 These components are more important decision factors when reviewing and choosing a jig saw to buy. The most important single feature a jig saw should be its ability to cut precise 90° angles without any blade wander. Since the jig saw blade is fixed at one end in the shank of the saw, it often tends to bend easily during the cut. While jig saw blade manufacturers have improved - especially large saw blades, by adding thickness with advanced materials - numerous power tool companies have developed special blade guide mechanisms to prevent the jig saw blade from bending and wandering as the user cuts thick workpieces. Automatic self-adjusting blade guide. 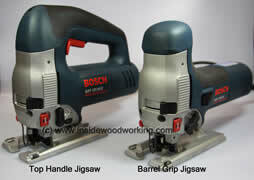 On various professional jig saws Bosch provides a "folk" type rear blade guide. Using a specially shaped small allen key the rear blade guide can be adjusted precisely to the thickness of the blade Certainly not given any A- ratings. As seen the standard rear wheel is used to guide the blade. Since it also pushing the blade forward during the orbital cutting action, it does not provide much guidance to the blade. Bosch and Festool jig saws are among the top brand names using a "folk" type guide for the blade. While Bosch' mechanism automatically self adjusts to the blade thickness. The Festool Trion psb300 is adjustable with a specially shaped 'Allen key.' Both of these guides use tungsten inlays for durability and precision. This is part one of our jigsaw review article. 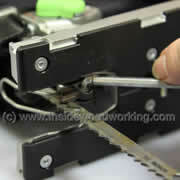 Part two on key jigsaw components such as blade change mechanisms, orbital action, jigsaw foot design, a review of the Makita jigsaw anti splinter inset, Bosch and Black and Decker jigsaw blade varieties as well as a final jigsaw product reviews comparison chart can be found on the next jigsaw review pages.